Clark is on his way to a vacation he won in the Bahamas when the plane he is flying in goes down over open water. 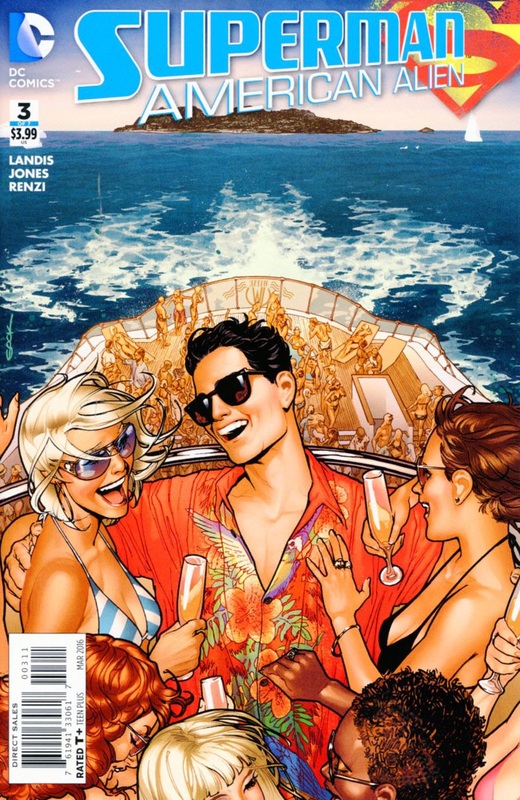 He and the pilot swim to a nearby yacht and Clark is immediately mistaken for Bruce Wayne. Clark plays along and meets a woman named Minerva, who figures out that he isn't Bruce. They talk for some time and eventually go to bed together and then talk some more. Clark is a bit drunk and heads to the bathroom. On his way Deathstroke the Terminator, thinking Clark is Bruce, attacks him but the fight goes poorly for Deathstroke. Once they reach shore Clark continues on his way hoping one day to meet Minerva again. Meanwhile Bruce Wayne finds out that a mystery man impersonated him and wants to know who that man is. Story - 4: This was a definite improvement over the last issue. Then again it didn't feel like I was reading some SMALLVILLE/CRIMINAL MINDS fan fiction so there's that. I realize that Landis isn't writing the definitive version of Superman with this series and even with that disconnect that comes from knowing I am reading a writer's take on Superman rather than reading the adventures of a version of Superman (Pre Crisis, Post Crisis, New 52, Earth One, etc.) this sort of story is more of the type that I want to read. Yes, I'm still mad about last month's issue. Anyway, I enjoyed this issue quite a bit. It was fun watching Clark break out of his comfort zone and pretend to be Bruce Wayne. On one hand the Bruce Wayne thing combined with meeting people like Oliver Queen and Sue Dibney and Minerva could be seen as fannish name checking but the heart of the story worked for me. This was Clark letting his hair down and trying new things. The fact that he hooks up with the future Cheetah is just icing on the cake and gives the reader (or at the very least it gives me) a sense that this is set in the DC Universe instead of some reality where Clark is the only recognizable character. This is why I liked the Deathstroke thing towards the end of the issue. You knew it wasn't going to go well for Slade and it was fun to see how that played out. Two things bugged me about this issue and they both happened on the last page. There was no need to see Bruce Wayne in this story. At all. It would have played better for him to be name checked and nothing more. It was fine when people mistook Clark for Bruce. It's another to see him. It feels like once again the best thing you can do for a Superman story is add Batman, which I've seen too much of in the past few years. I realize that Bruce is going to be in the next issue but it would have been better for the fall out of this to play out there. Also, while it is all fine and dandy, dandy and fine that Ra's Al Ghul trained Bruce in the Nolan films I hate the idea that that idea would be translated into the comics. Even a comic that isn't according to Hoyle continuity wise. It bugs me because the power of Bruce meeting Ra's in the comics is diminished if Ghul is there from the beginning. Other than that this comic was fine. I enjoyed myself. It helps that my expectations are so low after last month. Oh...the Mxy thing on the final, final page. Eh, it was fine. Nothing to jump up and down about. Art - 4: The artwork this time out was also enjoyable. The art style fit the story well and I got a lot out of the expressions and the body language of the characters. The storytelling was clear and the moments where Clark was a bit inebriated played beautifully. I am not a fan of the current Deathstroke armor but I don't think I can blame that on the artist. As with the writing I liked the art a lot more this time out than I did last month. Cover Art - 4: I keep typing the word "fun" but it keeps popping up in my head. Clark looks like he is having a great time and I kind of want that shirt. Variant Cover Art - 4: It's a woman in a two-piece bathing suit with the Superman symbol on her belly as if she drew it with sun tan lotion and sat in the sun for a few hours. It's not bad but it's nothing spectacular either.